We will have to wait a couple of months to get behind the wheel of the new MINI hardtop, but before we do MINI has unveiled a concept that will help build anticipation for the hardtop’s launch. 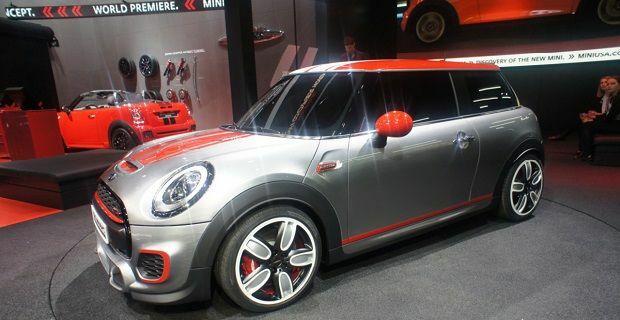 The MINI John Cooper Works concept shown at the 2014 Detroit Auto Show will be available at some point in the future but MINI is keeping tight-lipped about the car for now. Although we don’t have any specs to bring you, what we do know about the concept machine is that it is longer and wider than any Cooper Works car that’s come before. As MINI has added torque and power to the new Cooper and Cooper S models, we’re expecting this machine to improve on the existing car’s 208bhp. "The John Cooper Works Concept is based on the latest-generation MINI," officials said in a press release. "Its origins are clearly recognizable in the longer wheelbase and wider track over the outgoing model, which has a direct effect on the car’s driving characteristics,” so we can be sure that it will hold the road during hard cornering. Visually there are quite a few changes to the JCW including larger front air dams and a rear diffuser, both of which are unique to this machine. We like the wheels and the paintwork as both are pretty distinctive. MINI’s stand at the Detroit Auto Show also has convertibles and countrymen models, and the British brand has gone to town to get some attention. Anyone walking by their stand will find their eyes drawn to a raised area where a yellow MINI sits under the slogan “The new MINI. The new original.” MINI are hoping that the Detroit Auto Show will help them build on a successful 2013 when they sold 66,000 units in the American market. Small numbers by Ford or Vauxhall standards, but as BMW's board member in charge of Mini, Peter Schwarzenbauer said: "About 20 years ago it was unthinkable that a small, compact car could achieve these kinds of numbers."